One of the most exciting aspects of the Moto Z is its support of Moto Mods, which let you add anything from a projector to an optical zoom lens to the base phone. But these are just the beginning, as a recent Motorola hackathon saw the creation of numerous new mod concepts, including one which can monitor your skin. The concept, currently called ‘Bella’, is one of the most unusual smartphone accessories we’ve come across. It uses built-in sensors to collect real-time data from your skin, including the elasticity levels of your face. It can also measure UV levels and air quality, and use all this data to offer personal beauty and skincare tips. And that’s not the only interesting Moto Mod concept to come out of the hackathon. Other winners included ‘Sidepad’, which adds gaming controls to the Moto Z, so you’re not reliant on the touchscreen, and ‘Advanced Audio’, which adds high definition audio ports to the handset - so you can transmit audio to headphones and speakers in higher quality than if using the headphone jack. Those three stood out to the judges, but 17 Moto Mod concepts were submitted in all, including one which could monitor insulin levels, and one for testing water pollution – both of which, like ‘Bella’, could really expand the Moto Z’s functionality in directions you might not expect. Right now they’re all just concepts, but down the line any of them could become real Moto Mods. 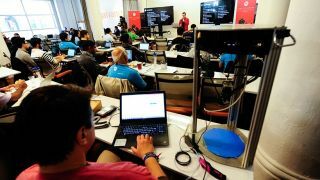 Another hackathon is happening in January and Motorola will be awarding the winners of both a cash prize and development kits, to help turn their ideas into commercial products. And this isn’t the only sign that the selection of Moto Mods could soon grow, as Motorola has already promised at least 12 new mods over the next year, all of which should in theory work with future models of the Moto Z too.